When thinking about making changes to your lifestyle sometimes a natural feeling of apathy arises – what difference can I really make? Is it really worth it? Whenever these thoughts cross my mind, I am reminded of a story that I grew up with about starfish. You can read an expanded version of the story here – I hope you find it as inspiring as I do that your small actions will make a difference, and combined with many others can change the world as we know it. A man was walking along the beach when he saw a boy picking something up and throwing it into the ocean. I’ve heard this story in several sermons – you probably have too. It’s a sweet story with the message that you can make a difference, one at a time. But it is strong on individualism – individual action resulting in individual rescue. 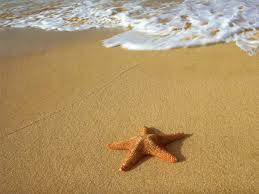 A man was walking along the beach when he saw a girl taking a picture of a starfish with her iPhone. Within hours, thousands of children stormed the beach and every starfish was rescued. The biggest difference between the man and the girl was what each of them expected. The man did not expect that all starfish could be rescued – he expected them to die. He thought the problem was too big, that it was just reality for starfish. But the girl was not a hostage to such low expectations. And that made all the difference. Expecting that every starfish could be saved unleashed her exuberant action, while the man slumped critically along the beach prophesying about life’s impossibilities. As the last starfish was tossed into the ocean, the children celebrated their accomplishment on the beach. It had been a good day – for them and for the starfish. But not all of them were celebrating. One boy faced the water, deep in thought.